By Alma Lopez , CorkStudentNews.com. 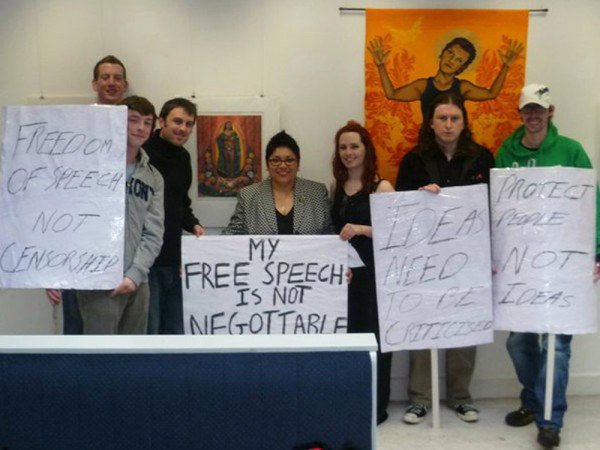 A recent exhibit by Mexican-born artist and noted Chicana feminist Alma Lopez provoked an international controversy after coming under attack from Catholic groups worldwide, the Bishop of Cork and Ross, Jerry Buttimer TD, and a number of local protesters, the latter of which braved the wind and the rain to maintain a two day vigil in protest outside the college gates. In this exclusive piece for Cork Student News, Lopez defends the exhibit, answers those calling it a ‘blasphemy’, and gives a little insight into her own time as a student at the University of California. In 1985, during the last quarter of my freshman year at the University of California Santa Barbara, I decided to become an artist. At that time, I would have never imagined that I was selecting such a dangerous career or that I would be creating an image that would arouse such strong reactions from fundamentalist Catholics all over the world. For over ten years, “Our Lady” and I have been stalked and harassed by the Philadelphia-based Mariolatrous organization America Needs Fatima (ANF), a campaign of the American Society for the Defense of Tradition, Family and Property (TFP) lead by executive director Robert Ritchie. America Needs Fatima in (editor’s note: alleged) collusion with John Buckley, the Catholic bishop of Cork and Ross and Cork South Central TD Jerry Buttimer, misrepresented my work and my intentions and thereby incited some Catholics in Ireland to declare “Our Lady” as blasphemous. My photo-based digital print, titled “Our Lady,” is a work of art intended for exhibition in spaces such as museums, galleries, community centers and universities. It is obviously, not an image in a church. Its purpose was not to address Catholics or Catholicism in any way. It is is a photo of a model named Raquel Salinas, who was posing for me in 1999, in a collaborative effort to discern the meaning of the Virgin of Guadalupe in our own lives. The model is not naked in the photo, she is not wearing a bikini, and she is not being crude, sexual, or provocative. In making “Our Lady” my intent was to portray a strong Chicana in the position of respect and honor that is given to the Virgin of Guadalupe. She is adorned with some of the symbols of the Guadalupe, such as the halo, and the crescent moon, but she is also wearing a cape that represents the Aztec moon goddess, Coyolxauhqui, as a representation of both her strength and her indigenous history. For me as a Mexican-born Chicana, the Virgin of Guadalupe is an important cultural image that I grew up with in my family and in my community, and that graces the walls of my own home. More than a religious icon, the Virgin of Guadalupe is a revolutionary image of indigenous resistance to colonization and genocide. 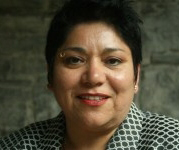 “Our Lady” arrived in Ireland because I was invited by the Department of Hispanic Studies and the Centre for Mexican Studies at UCC to be a keynote speaker and exhibit my work at the conference, “Transitions and Continuities in Chicana/o Culture.” This international conference and exhibition intended to introduce and highlight Chicana/o culture to the university community of Cork. I believe, this space was the most appropriate place to exhibit “Our Lady.” After all, universities are sites of learning, and where sharing of differences are done with mutual respect and understanding. Alicia Gaspar de Alba, my legally-wed same-gender spouse and I returned home from Ireland last weekend feeling happy about bringing our work to Ireland. We thank our hosts and others we met for a memorable time, and hope to return. We encourage Irish citizens to unite to remove the blasphemy laws from their country in order to be free of the threat it poses to their freedom of expression and other rights granted in a democratic society. Blasphemy.ie website dedicated to raising awareness about Ireland’s recently introduced blasphemy legislation.